First Class and First Beer. The trip down to Colombia was about as easy as it could have possibly been. We flew from Denver to Houston, Houston to Panama, and then on to Cartagena. We were able to carry on our bags on all the flights, avoiding the dreaded lost bag blues. Surprisingly all flights even left on time! On our last leg we were lucky enough to be seated in first class (we weren’t quite sure why), and even though it was a 50 minute flight, it was still snazzy. Being “stuck” in first class gave me the opportunity to start my odyssey in the quest for beer. Excuse the quality, but we did not want to use the flash and stick out like sore thumbs… like total tourists. 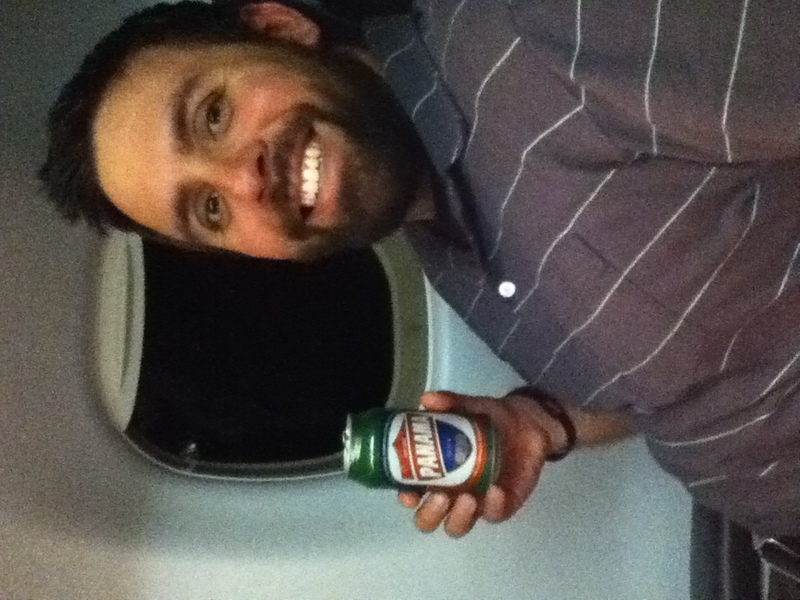 Cerveza Panama Lager was the first official beer sampled on the trip. I had to drink it pretty quickly because by time it was served, we basically were starting our decent. This beer brings back many memories for me from when my family and I lived in Panama. I remember my dad and sister (sorry Amy) sometimes drinking these while visiting the beach or hanging out with friends. Nothing too spectacular to report, if you have had a Budweiser you have pretty much had a Cerveza Panama. Even being a mediocre beer, it tasted great as we toasted the start of our crazy trip. Never fear chip lovers! Plenty sampled so far, but nothing worthy to report yet! This entry was posted in Colombia, Joe's Chips and Beer and tagged beer, first class, panama city. Bookmark the permalink. 3 Responses to First Class and First Beer. Enjoy your beer, and have fun sampling them! And, while you’re there anyway, you might as well check out a few other things to do there, I suppose. Or not. Woo! I was counting on some family member to get that reference! Also, currently enjoying another beer while hiding out from the heat, but don’t worry, we might get around to other stuff soon! Score re: first class!! Glad to hear you decided not to wait for the plane to touch down in Columbia before beer sampling! Can’t wait to read about more adventures!